Sigma has released new lenses and reorganised its lens lineup, with three new groupings designed to provide guidance to photographers when choosing a new lens. Announced at Photokina 2012, first of the three new categories is Contemporary, which features the very latest technical and optical performance and includes standard zoom lenses, telephoto zoom lenses and high-magnification zoom lenses. Next up is Art, which Sigma says is designed with a focus on sophisticated optical performance and tremendous expressive power. Art lenses include large aperture prime lenses, wide-angle lenses, ultra-wide-angle lenses, macro lenses, fisheye lenses and more. The final category is Sport, with lenses designed for capturing action and movement, including telephoto lenses, telephoto zoom lenses, super telephoto lenses, super telephoto zoom lenses and more. A Sigma 17-70 f/2.8-4 DC Macro OS HSM lens is the first new lens for the Contemporary category. Mainly designed for general purpose photography, the lens gives equivalent focal lengths of 25.5-105mm on a 35mm camera. Though compact in size, the lens has a large aperture which opens to a maximum of f/2.0 at the wide-angle end of the optic. With a minimum focusing distance of 22cm throughout the zoom range, the lens is also useful for macro photographers. Sigma's own Optical Stabiliser function is incorporated to offer correction against camera shake of approximately four stops. FLD ("F" Low Dispersion) glass and SLD (Special Low Dispersion) glass are used, which Sigma says helps to combat chromatic aberration. Three aspherical lenses, including a double-sided aspherical lens, are design features of the lens. A new lens in the Art category is a 35mm f/1.4 DG HSM. An FLD glass lens and four SLD glass lenses are included to correct chromatic aberration, while Sigma's multi-layer coating was designed to reduce flare and ghosting. A hypersonic motor (HSM) is incorporated for high speed and quiet autofocus, as well as full-time manual focus override by rotation of the focus ring. 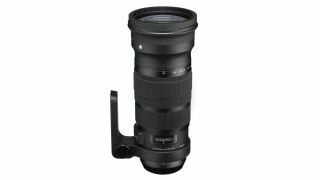 Finally, in the Sports category, there's a new Sigma 120-300mm f/2.8 DG OSM lens. The lens is dust and moisture-resistant, designed for use in harsh shooting conditions. Multi-layer coating again reduces flare and ghosting and provides high contrast images even in backlit conditions. An HSM is also included, along with a rounded nine blade diaphragm to create an attractive blur to the out of focus areas. There's also newly developed USB dock, and special software that can update the lens firmware and adjust parameters such as focus. Using a special USB dock, you can connect the lens to a PC and, using on-screen controls, tune focus and other parameters. Prices and availability for all of the new Sigma products have yet to be announced.